How To Learn Calligraphy (for beginners). How to learn calligraphy efficiently. In our fast-moving world, it’s easy to overlook the amount of effort and time necessary to achieve true mastery of a skill. We millennials are obsessed with instant gratification. We often give up too soon, and in doing so, develop poor habits, relationships, and skills. In our minds persistence is confused with stubbornness and repetition is confused with a sign of stupidity. Good calligraphy requires a ton of repetition and the only way to go through it is with an abundance of will. Calligraphy, if mastered to even a limited extent, is a good skill which teaches the beauty of improving yourself with repetition. This narrative provides a Beginners’ How-To for getting started with calligraphy. This is just bare-bone essentials and hacks around some of the hurdles around the millennia-old art form. Of course, it's a plus if you understand typography and you spent time setting type, but it's not required to get you started for sure. Especially for beginners, ink, classical feathers and tips create another level of complexity which makes the task absolutely unbearable. On top of learning how to write, you need to learn to control the ink flow, drainage, spills, etc. The ink is also not paper agnostic. You need to find the right paper and also to keep your hands off of the writing area. The natural moisture and sweat off your fingertips create invisible stains on the paper, which will prevent the consistent transfer of the ink on the paper. All those things, combined with you not knowing how to form a single letter, will make you feel dreadful and you will probably quit before you have even started. To avoid everything mentioned above, you have to start with much more forgiving tools. Use a normal printer paper and one of those calligraphy “fountain” pens, brush pens or markers, depending on what type of calligraphy you want to try. Most of the calligraphy markers out there are pretty good. You can’t go wrong with any of these ZIG, Sakura Pigma, Faber-Castell, Pilot. If you still want that inky feel but in very controlled manner you can try Pilot Parallel Pens. In general you can explore JetPens.com it has very good explanations and examples of how the pens perform. Start with flat calligraphy marker and try “foundation hand” script and then slowly transition to classical gothic styles or italic roman treatments. I’m saying it just because it’s easier than a brush pen. With which, you have to not only control direction but also wonder about pressure and tilt. With the flat pen, you don't have to worry about pressure factor, because it’s firm and consistent for the most part and the only thing you have to know about tilt is that you don’t have to tilt or rotate it at all! Which, by the way, will probably be the first thing you will struggle with. 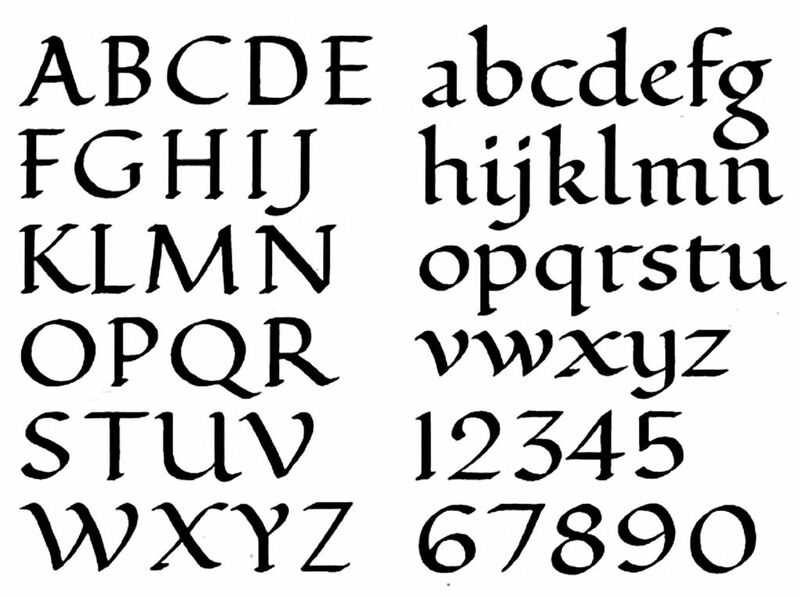 There are plenty of great articles and videos on how to draw letters from a specific script. My only tip here is to start with something as simple as this. Again, the simplest possible script with as little pen movement as possible. You can check calligraphy-skills.com and watch Joanne Fink tutorial videos on foundation hand - lowercase letters, UPPER CASE LETTERS. One thing you should also consider is the size of the letters you are drawing. My suggestion here is to start small again. Smaller pen tips 2-3mm will keep you closer to your natural handwriting movements. One thing to consider is muscle memory. If you feel you are always defaulting to your handwriting you can try to focus on writing slowly and deliberately. If that doesn't work just try out a thinker tip size pen. The thicker pen will force you to write larger letters, which will steer you away from the handwriting habits and bring you closer to drawing. If you have drawing experience, your hand will probably be accustomed to longer brush or pen strokes, which means you can start with thicker flat pen tips. Once you mess up something there is no CMD+Z. When you mess up, just don’t stop finish the word or the sentence and start again, and again, and again, and again. Especially in the beginning, you will have to write something at least 100 times to make it look decent. Set your goal to writing something beautiful within 100 tries. So, don’t get frustrated if it’s not perfect within the first 10 times. Repeat and refine, repeat and refine. This is pretty self explanatory. The bare minimum is probably to follow guidelines for your x-height. Especially, in the beginning, it will be hard for you to understand what exactly is wrong with your writing. You can also find printable sheets with guides on them for a specific size of pens. Just make sure you have the guides for your pen size. Loops & Tails Site dedicated to learning calligraphy. Includes worksheets for beginners. Ultimately, calligraphy will allow you to better understand how type works and when and why it looks balanced and amazing. It will be very easy to understand otherwise abstract typographical principles, letter form balancing and type design. Also, as a designer you will expand your understanding of otherwise obvious things like kerning, tracking and spacing in general. On top of all the design specific skills you will inevitably improve your patience, attention span, and focus. You will feel a lot more prepared and resilient to early disappointments and missteps next time you have to face a enormous challenge.